Dante's View is a high overlook near the edge of the Black Mountains, which form the eastern border of this part of Death Valley, and it gives the best overall views of southern half of the national park, ranking alongside such locations as Glacier Point in Yosemite Valley and Moro Rock in Sequoia National Park as one of the best easily-accessible, high elevation viewpoints in California. From the roadside overlook, a short path climbs to the actual summit (Dante's Peak), which has even better views, while nearby Coffin Peak is reachable by a rather longer but still relatively easy off trail hike, and gives an alternative perspective, revealing more of the lands to the south and east. View from the summit of Dante's Peak. Dante's View is reached by a 13 mile spur road that runs south from CA 190, just inside the eastern park boundary - the route is fairly level at first, heading along the wide Greenwater Valley then climbing quite sharply, from 3,000 feet to the summit at 5,450 feet. On the way, the road passes a sprawling boron mining complex at Ryan, adjacent to the national park - a development that seems rather out of place amongst the surrounding unspoilt scenery. Notices warn against trying to approach any of the excavations. Large vehicles are advised to use a parking area shortly before the end of the road since the last quarter of a mile is extremely steep (15% grade) and winding, though the final flat area at roads end has plenty of space. 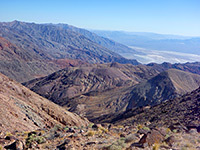 The viewpoint is quite close to Badwater; the horizontal distance is about two miles, but the vertical distance is another mile (5,700 feet). The summer temperature at Dante's View is often in the 90s; it is amazing to think that the parched land far beneath will be at least 20°F hotter. 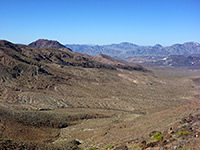 From the summit, one can see north and south along many miles of salt flats and sand dunes, and also west across the valley to several lifeless mountain ranges, which fade into the distance due to the ever-present heat haze. 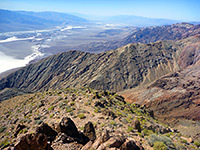 The highest summit usually visible is Telescope Peak at 11,049 feet, part of the Panamint Range, although 14,495 foot Mount Whitney can be glimpsed on clear days, when it is therefore possible to see the highest and lowest points in the contiguous US from one place. Rocks around the overlook are twisted, eroded and very colorful - many shades of purple/red/black, the result of past igneous activity, and provide quite a contrast with the vast flat expanses of salt and sand in the valley beneath. A path follows the ridgeline south about 1,000 feet to an alternative viewpoint, but rather better views can be had from the top of Dante's Peak, half a mile north. The lesser used trail climbs rocky slopes gaining about 300 feet in elevation, past an intermediate ridge and on to the summit, from where more of the northern valley can be seen, as well as a large expanse of ridges and valleys in the adjacent mountains. Another option for further exploration is to walk eastwards to Coffin Peak, starting from the large vehicle parking lot just before the end of the road. This summit has views over the colorful Coffin Canyon to the south, and of Greenwater Valley to the east, and is reached by an easy walk over grassy hillsides, strewn with white gypsum crystals. 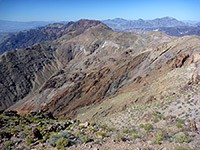 Although the land is not too steep there are several false summits before the actual high point, separated by ravines, so the hike takes somewhat longer than the two mile round trip distance might suggest.